Here is a more elegant spin on the Woodland idea from the very talented Amy Atlas. I love how she uses the tree trunks as cake stands. These would make a great addition to a fun color centerpiece as well. She displays two almond fondant cakes and placed them on tree trunk cake stands. She created pistachio cinnamon meringue and tuiles filled with spiced-apple custard. Then wrapped hazelnut truffles with custom faux-bois tissue paper. All gorgeous!!! love it and love her! Love all your woodland ideas! 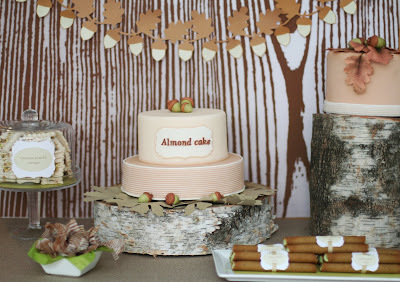 If only I had seen this before I planned my woodland party, Love your blog, great ideas! Love this so rustic, would work great for a rustic wedding or bridal shower too! doesnt she just have the BEST ideas! !